OSWEGO – The Oswego City School District has welcomed some of its youngest students to the 2018-19 school year with an orientation event to help them become more comfortable as they begin their OCSD educational journey. 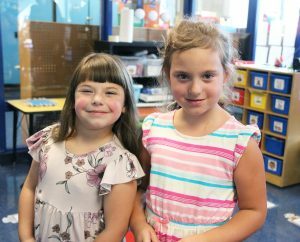 Kindergartners and cousins Sophia Ingersoll and Isabella Coffey share their excitement for beginning school at Fitzhugh Park Elementary. The pair recently explored their classroom during a recent kindergarten orientation event. Members of the future Class of 2030 were able to meet their teacher, explore their classroom and make new friends during recent kindergarten orientations at Fitzhugh Park, Kingsford Park, Charles E. Riley, Frederick Leighton and Minetto elementary schools. During FPS’ celebration, Principal Donna Simmons thanked parents for entrusting their children to FPS. She said she has recognized the students’ half-day pre-school schedule to full-day kindergarten will require an adjustment period, and she promised FPS kindergarten teachers and other staff members would be there to support the children every step of the way. 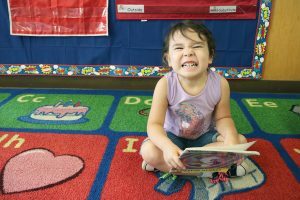 Charles E. Riley Elementary School kindergartener Luna Hopkins flashes a smile during the building’s meet-the-kindergarten-teacher event, a week prior to the start of the 208-19 school year. Simmons also offered the following helpful hints for a successful first year: set a routine, have the child practice writing his or her name, practice washing hands and other healthy habits, get plenty of rest and plan a time to talk about school each day. Meanwhile, at Riley Elementary, kindergarten students were thrilled to visit their classrooms ahead of the first official day of school. Parents and students, alike, familiarized themselves with their surroundings and some even completed a treasure hunt.